Obama File 26 William McNary, Yet Another Obama Radical? Since his youth Barack Obama has seldom been without a communist or socialist in his life. Obama has been supported, his entire political career, by people connected to several Marxist organisations, particularly Democratic Socialists of America (DSA) Communist Party USA (CPUSA) and Committees of Correspondence for Democracy & Socialism (CCDS). This post looks at a close associate of Obama's, a friend, long time colleague and political supporter-William McNary. Who is this man? How is he connected to Obama? Why does it matter? William McNary has been called one of the most electrifying and inspirational speakers of our time. McNary serves as the President of USAction, the nation’s largest coalition of progressive grassroots organizations working together to win social, racial, economic and environmental justice. Before joining USAction McNary served for 12 years as Legislative Director of Illinois Public Action(IPA)-now known as Citizen Action/Illinois. Both IPA and USAction were and are heavily infiltrated by Marxists-several of whom have close connections to Barack Obama. In the mid 90s IPA's board included Obama's long time friend, DSA member Quentin Young, his one time boss and CPUSA front activist Alice Palmer , long time supporter, "DSA friendly" Democratic Congresswoman Jan Schakowsky and Obama supporting DSA linked unionist Tom Balanoff. Several other DSA members were active in IPA and two Chicago CPUSA members, Frank and Bea Lumpkin are credited with major roles in building the organisation. USAction was founded by Heather Booth, who now serves as vice president under McNary. A former member of the 1960's radical organisation Students for a Democratic Society, Booth was closely connected in the '70s to the Chicago socialists who went on to help found DSA in 1982. Booth went on to found the DSA run Midwest Academy, an infamous training school for agitators, unionists and activists. Obama was close to the Midwest Academy before and after entering politics. USAction's board seats several radicals including former Chicago DSA activist John D Cameron. USAction Program Director Alan Charney was formerly DSA's National Director. How well does William McNary know Barack Obama? I am also a voter. And in this election, I am supporting Barack Obama, whom I've known and worked with for years. I am also an elected delegate to the Democratic Convention for Barack Obama. William McNary is...one of Obama's personal friends and long time supporters - someone Obama went to when considering his run for Senate and for president. William loves Obama and I know beyond the shadow of a doubt he would not serve on an organization board that was trying to favor Clinton over Obama. At last week's Democratic Convention in Denver, Mcnary compared his friend to Martin Luther King. When this country was first started, the only ones who could vote were white men with property. The we extended the boundaries of democracy to include women and people of color and religious minorities. Who would have thought we would have expanded the boundaries of democracy so wide that someone like Barack Obama, an African American, could run and win. So Barack Obama is not just a culmination of King's dream, he's the culmination of the American dream. So its clear that McNary is a supporter of Obama's, a former colleague and a friend. Possibly even someone Obama turned to when making his biggest political decisions. Why should that concern us? We should be concerned because while a Democrat, McNary has close and recent ties to several Marxist organisations. Every year Chicago DSA hosts a major awards dinner, named after prominent socialists Eugene Debs, Norman Thomas and Michael Harrington. Most of the speakers and award recipients are DSA members, sympathetic socialists or communists. As recently as June 2008 McNary attended a DSA/CPUSA organised demonstration in support of striking workers at Chicago's Congress Hotel. McNary works closely with several Chicago socialists in oppostion to the Iraq War. 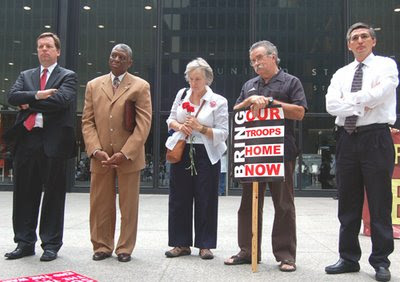 From left to right, Alderman Joe Moore (49th Ward), William McNary, Catherine Buntin, Carl Davidson and Alderman Ricardo Munoz (22nd Ward) hold a press conference at Federal Plaza in Chicago, Sept. 21, to launch mobilizing efforts for the Midwest regional antiwar demonstration on Oct. 27. Joe Moore is a leftist Democrat and a strong Obama supporter. Carl Davidson is a leader of the CPUSA breakaway organisation, Committees of Correspondence for Democracy and Socialism (CCDS). Like Heather Booth he was active in SDS and has worked very closely with Barack Obama. He helped organise the famous 2002 chicago peace rally where Obama first made his name as an opponent of the iraq war. In 1994 Munoz attended the founding conference of CCDS in Chicago with long time Obama friend and supporter, Chicago Congressman Danny K Davis. Munoz was a pledged Obama delegate to the Democratic Convention. Even more concerning are McNary's ties to the Communist Party. McNary wrote an article opposing drug company profiteering for the February 16th 2002 edition of the CPUSA newspaper Peoples Weekly World. Every year the Illinois branch of CPUSA hosts a banquet to raise funds for the party's paper. No matter the issue, if it affects working people, William McNary, president of USAction, is there, fighting the good fight for social and health security, quality public schools and against the right-wing agenda. McNary and the CPUSA both supported Obama in his 2004 Senate race. While outside the democratic party mainstream, Obama was able to win by stitching together a coalition of socialist/communist dominated unions and "community organisations. The race for the Democratic nomination for the open U.S. Senate seat in Illinois has boiled down to a three-person race, according to polls. Millionaire Blair Hull has a slight lead after pouring $18 million of his own money into an advertising blitz. State Sen. Barak Obama and State Controller Dan Hynes trail him, with a large undecided vote remaining. The primary will be held March 16. At several campaign rallies across this city on Feb. 21, Obama said that after the presidential race, the Senate race in Illinois might be the most important. He noted the historic potential of his campaign, aside from helping break the Republican majority. If successful he would be only the third African American since Reconstruction elected to the U.S. Senate. Of all the candidates, Obama can boast the most diverse support. While Hynes has the backing of the state AFL-CIO and the bulk of the Democratic machine, Obama has the support of several key unions including the American Federation of State, County, and Municipal Employees; Service Employees; Hotel Employees and Restaurant Employees; the state American Federation of Teachers; Chicago Teachers Union and Teamsters Local 705, the second largest in the country. Obama has a 90 percent voting record on labor issues in the Illinois Senate. In addition to widespread support in the African American community, Obama has also received the backing of several independent Latino elected officials led by State Sen. Miguel del Valle, Rep. Cynthia Soto and Alderman Ray Colon. Alderman Joe Moore from the North Side is also backing him. 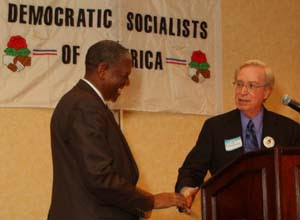 If that isn't enough, in July 2005 William McNary was a keynote speaker at the CPUSA National Convention in Chicago. 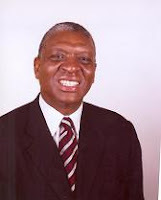 Of the fifteen speakers and panellists listed only McNary and James Thindwa were not confirmed Communist Party members. Here is a Youtube audio of McNary's speech to the conference. Note CPUSA Political Action Committee chair Joelle Fishman (daughter in law of Soviet spy victor Perlo, by the way),thank McNary for the warm welcome he gave her when she represented the CPUSA at the founding convention of USAction. Note McNary's repeated use of the word "we" when addressing the hundreds of cheering communists assembled. McNary gives the impression of being among friends. In recent years, the annual Take Back America conference has brought together hundreds of socialists, communists and leftist Democrats to plan the "progressive" conquest of America. Barack Obama was a keynote speaker at the 2006 conference. The 2008 conference was covered for Peoples Weekly World by the paper's former editor, CPUSA National Board member Tim Wheeler-who is incidentally active in Obama's Baltimore organisation. Change. Where have we heard that word before? Did you cover Working Families Party? The New Party morphed into the Working Families Party which is alive and well in New York State. Ask Hillary, that is part of what got her elected to the US Senate. Now they endorse Obama....he hasn't left his socialistic agenda behind, just embraced it under a new name!